Who said dollies are only about pretty dresses and tea parties? These fun-loving dolls love to ride! They spend their days at the stables, grooming their favourite horses and generally having a great time. But what do they wear? Well, that’s up to you. 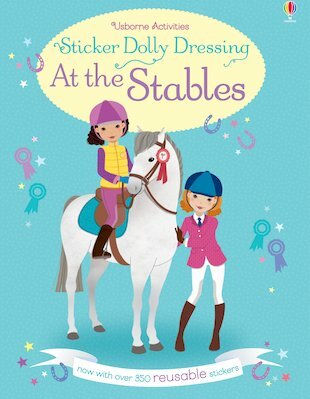 You get to choose their perfect outfits for showjumping contests, pony care and going on a trail ride. You get over 350 reusable stickers of outfits and kit for all the stuff they do: pony camp, a day at the ranch and (whisper it) mucking out!